Background: Many of the characteristics of inguinal hernia repair are especially well suited to the transgastric approach. The repair is inline with the transgastric scope vector, bilateral defects are adjacent and the intraperitoneal onlay mesh (IPOM) technique does not require significant manipulation or novel instrumentation. 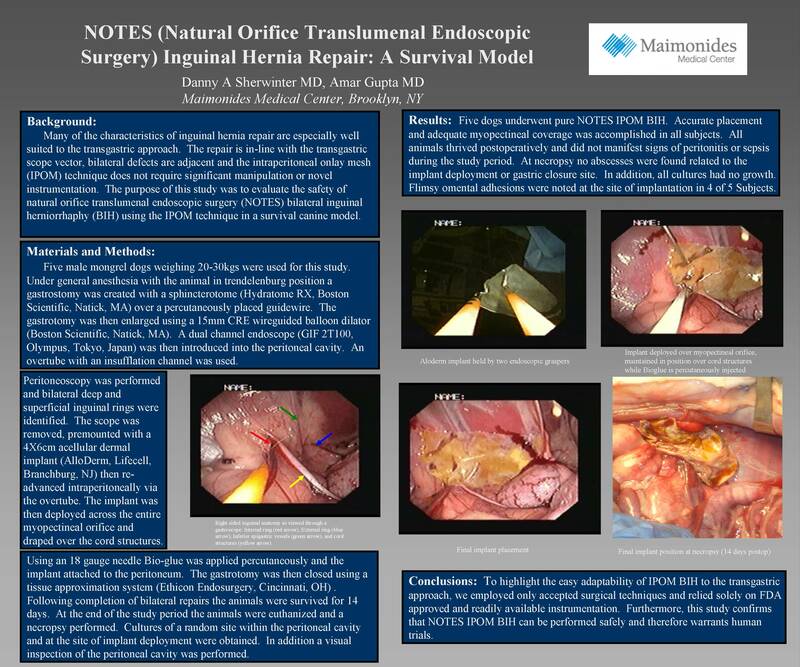 The purpose of this study was to evaluate the safety and durability of natural orifice translumenal endoscopic surgery (NOTES) bilateral inguinal herniorrhaphy (BIH) using the IPOM technique in a survival canine model. Results: Five dogs underwent pure NOTES IPOM BIH. Accurate placement and adequate myopectineal coverage was accomplished in all subjects. All animals thrived postoperatively and did not manifest signs of peritonitis or sepsis at any point. No adhesions or abscesses were found related to the implant deployment site and all cultures had no growth. Conclusions: This study confirms that NOTES IPOM BIH can be performed safely and warrants human trials.